If Krispy Kreme tells us to embrace cheating on our diets, we won’t fight it. In fact, we’ll cheat on our diets with Krispy Kreme’s new chocolate-glazed doughnuts. And this is exactly why Krispy Kreme, for the very first time, has taken the four most popular filled doughnuts and glazed them all with chocolate. Because if you’re going to cheat on your diet, you might as well go big. Don’t get it twisted, though. The message here isn’t to ditch your diet but to merely allow yourself to indulge every once in a while. And Krispy Kreme wants you to choose them on your next cheat day. 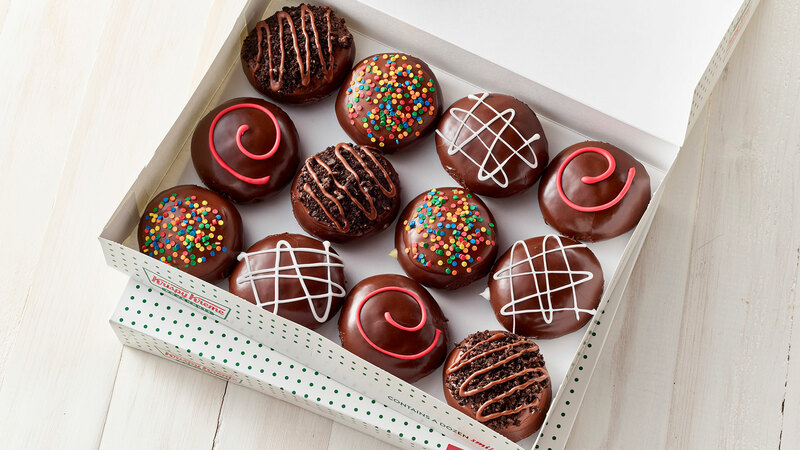 Starting today for a limited time, Krispy Kreme’s Chocolate Glaze Collection is up for grabs and includes the following classic flavors: cake batter, raspberry-filled, chocolate-iced Kreme-filled and Oreo Cookies & Kreme doughnuts. All of the chocolate-glazed doughnuts are topped with a complementary icing or garnish too. The cake batter doughnut is topped with sprinkles, the raspberry-filled doughnut is topped with a decorative red icing swirl and the chocolate iced Kreme-filled doughnut is decorated with white icing. The Oreo Cookies & Kreme doughnut, on the other hand, doubles down on the chocolate and is topped with both Oreo cookie pieces and chocolate icing. Unfortunately, these new flavors are only available through Jan. 27 at participating Krispy Kreme locations throughout the U.S. and Canada. So don’t wait. And while you’re there, why not pick up their limited-edition cinnamon swirl doughnuts? They likely won’t last much longer, either.